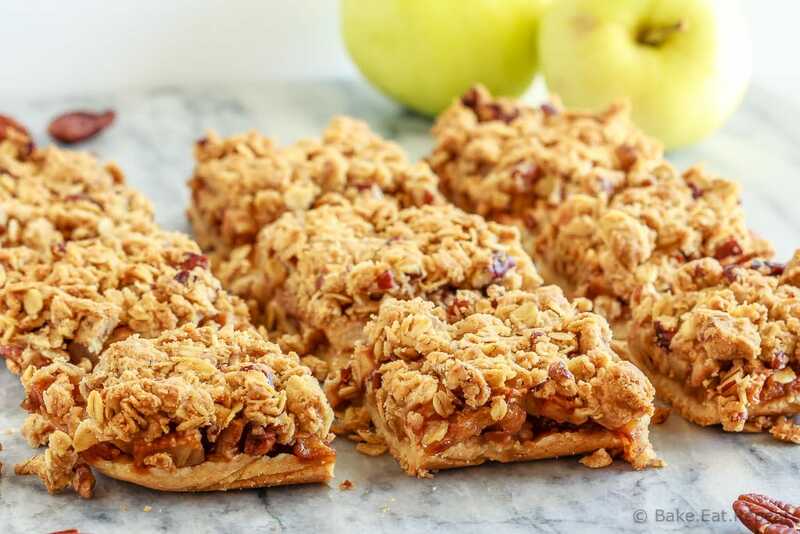 These easy to make apple pie bars have a shortbread crust, a cinnamon crumb topping and an amazing apple pie filling – the perfect fall dessert! It’s fall – the best time of the year for baking! Ok, that’s not really true. Mostly because I love to bake any time of the year. But also because Christmas is definitely the best time for baking. I do really love baking all the apple and pumpkin things in the fall though. My family probably gets quite tired of all the apple and pumpkin they’re forced to consume in the autumn months, but oh well, what can you do? I certainly didn’t get any complaints about this particular apple thing. 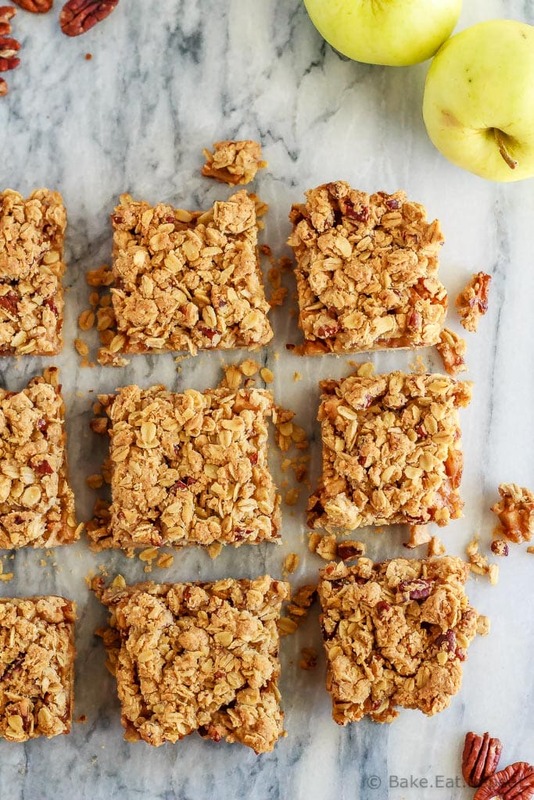 These apple pie bars are exactly that. 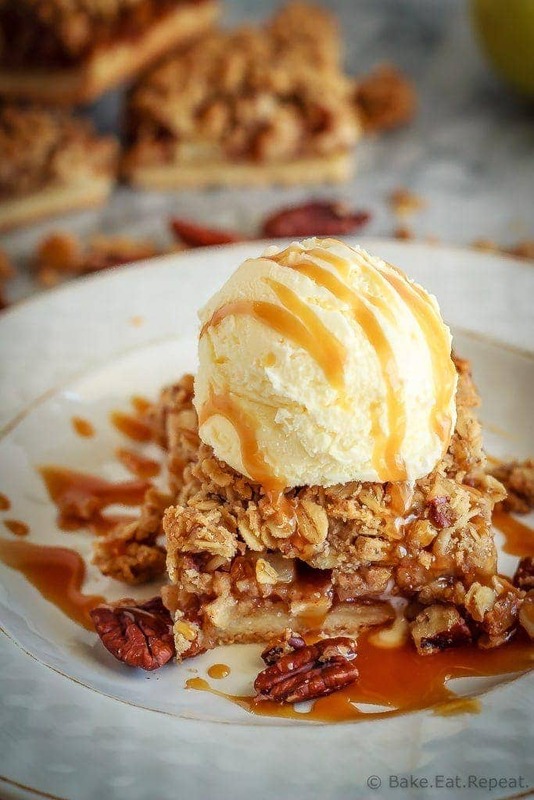 Apple pie in bar form. And they’re amazing. They’re absolutely delicious with a shortbread base, a sweet, cinnamon filled apple pie filling and a buttery crumb topping (that is actually made from the base so it’s super easy). These apple pie bars are a terrific fall dessert – and would be perfect to bring to a party. Like a baby shower – which I’m celebrating with some friends here today! Three of my blogging buddies are having babies in the next few weeks, so a group of us decided to get together and celebrate their little pumpkins by having a virtual baby shower. It would be so much better if we could get together in person to celebrate, (for one thing, the food would be fantastic! ), but unfortunately we all live way too far apart for that. So this is the next best thing! So if you’re planning a shower or party of some sort this fall – your work is made easy for you today as there is a whole list of fall inspired recipes for you today from my foodie friends. 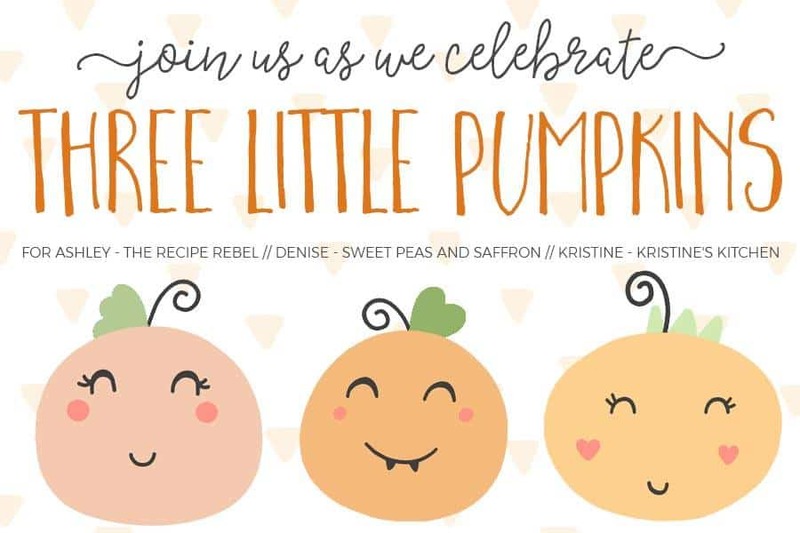 Just scroll down to below the recipe to see what everyone is cooking up to celebrate Kristine (Kristine’s Kitchen), Denise (Sweet Peas and Saffron) and Ashley (The Recipe Rebel) today! 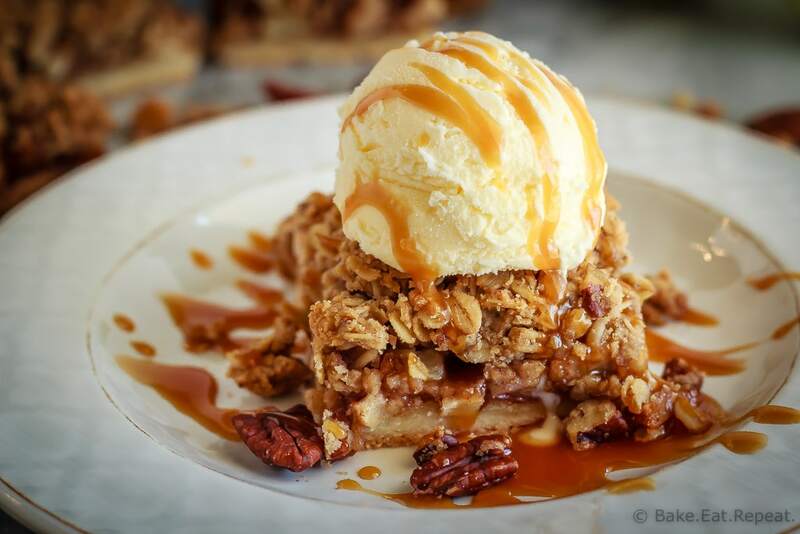 Also – these apple pie bars are amazing just as a bar you can pick up and eat – but they may be even better warmed up with a scoop of vanilla ice cream and some salted caramel sauce for dessert. So don’t wait for a party to make them! this bar recipe can be doubled and made in a 9×13 inch dish if you need a larger amount – in an 8×8 inch dish like I made you can get anywhere from 9-16 bars depending on how large you cut them. I may have cut them obnoxiously large to have with ice cream and caramel sauce for dessert. And I have no regrets. These easy to make apple pie bars have a shortbread crust, a cinnamon crumb topping and an amazing apple pie filling - the perfect fall dessert! Preheat the oven to 375 degrees F. Line a 8x8 inch baking dish with tin foil, leaving an overhang on all sides and lightly grease the foil. Set aside. In a food processor or stand mixer, combine the flour, sugar and salt for the crust. With the mixer running, add the butter, one piece at a time. Process for 1-2 minutes, or until the mixture resembles damp sand. Remove 1/2 cup plus 2 tablespoons of this mixture and set aside in a medium bowl for the topping. Press the remaining crumb mixture into the prepared pan, packing it down as tightly and evenly as possible. Bake for 14-16 minutes or until just beginning to brown on the edges. While the crust is baking, prepare the topping and the filling. For the topping, add the brown sugar, rolled oats, cinnamon and pecans to the reserved crumbs and stir to combine. Add the butter and use your hands to rub the butter into the crumb mixture, squeezing handfuls of the crumbs together so that it clumps into hazelnut sized lumps. Set aside. For the filling, toss together the apples, brown sugar, flour, lemon juice, and cinnamon in a medium bowl until combined. Spread the filling on top of the hot crust. Spread the topping evenly across the filling. Bake the bars for 25-30 minutes, until the topping is golden brown. Remove from the oven and allow to cool completely in the pan (1-2 hours) before lifting the bars out by the foil overhang and slicing into bars. The bars are best the first day, after that the shortbread crust and the crumble topping starts to soften. Source: Adapted from these blackberry crumble bars . These looks SO good, Stacey! Apple pie is my husband's favorite and I love how much easier bars are to make! The perfect dessert for fall! I've caught the baking bug big time lately (maybe I'm nesting?) and these look SO good, Stacey! Thank you so much for making my day with this shower...you ladies are the absolute best! These look SO good! You've got pretty much all of my favorite things right here -- especially that crunchy streusel! You guys are the sweetest! So glad we got to meet and hang out for a few days! Oh yes! These bars with a big scoop of ice cream are my dream dessert right now!